Liz and Sarabeth were girlhood neighbors in the suburbs of Northern California, brought as close as sisters by the suicide of Sarabeth's mother. In the decades that followed, their relationship remained a source of continuity and strength. But when Liz's adolescent daughter enters dangerous waters, the women's friendship takes a devastating turn, forcing Liz and Sarabeth to question their most deeply held beliefs about their connection. From the bestselling author of The Dive from Clausen's Pier, Songs Without Words is the gripping story of a lifelong friendship pushed to the breaking point. Ann Packer received the Great Lakes Book Award for The Dive from Clausen's Pier, which was a national bestseller. She is also the author of Mendocino and Other Stories. She is a past recipient of a James Michener award and a National Endowment for the Arts fellowship. Her fiction has appeared in The New Yorker, Ploughshares, and other magazines, as well as in Prize Stories 1992: The O. Henry Awards. She lives in northern California with her family. Ann Packer has been praised for the lifelike quality of her fiction. Do you feel that the friendship depicted here seems especially true to life? Do you find yourself choosing sides with either Liz or Sarabeth? Why does Lauren attempt to kill herself? What are the immediate and the more suppressed causes? How does Lauren herself explain it? Liz tells Brody that she feels completely guilty for Lauren's suicide attempt. "I know, it sounds crazy," she says, "but the point is: if it was your fault, then you weren't powerless—you weren't at the mercy of stuff just happening." To which Brody replies: "You're always going to be at the mercy of stuff just happening, no matter what". What different ways of looking at life do these two positions represent? To what extent are they "at the mercy of stuff just happening"? Thinking back over her relationship with her daughter, Liz imagines herself "bowing to Lauren, acknowledging Lauren. Had she somehow failed to do that? She couldn't think of anything more important for a mother to do". Why would nothing be more important than this kind of acknowledgment of one's child? Why does Liz choose the word "bowing"? After Lauren has returned from the hospital, Liz admits to Lauren that she and Sarabeth are "having some problems." After that, Lauren occasionally asks her mother about her relationship with Sarabeth. Do you think Lauren is intentionally pressuring Liz to talk to her? Do you think it's Lauren's place to pressure her mother about Sarabeth? Liz and Sarabeth have a long history together. Do you think that, without Lauren's attempted suicide, Liz and Sarabeth would have ended up in the same place anyway? Why do you think Lauren is drawn to Sarabeth? Do you think it has more to do with Sarabeth's experience with depression and suicide, or with Sarabeth's knowledge of art and her less-conventional life? Or something else entirely? Why doesn't Sarabeth call Liz immediately when she learns of Lauren's suicide attempt? Is her reaction selfish or merely self-protective? Why does Liz tell Sarabeth, "I'm not your mother"? Is she justified in saying this? How does it affect Sarabeth, immediately and ultimately? Brody describes Sarabeth as "five feet of chaos". In what ways is this statement true of Sarabeth? What is the effect of tragedy—the suicide of Sarabeth's mother and Lauren's attempted suicide—occurring in such seemingly ordinary, and in Lauren's case loving, families? Near the end of the novel, after Joe has won at poker, he thinks: "The cards didn't really matter. What mattered was how you played. What mattered was your face". In what ways might this apply to the lives of the characters in the novel? How are Liz and Brody able to repair their marriage? Why does Lauren's attempted suicide create such anger and distance between them? What do you think about the hostility between Sarabeth and Brody? Do you think they would have gotten along better if not for their relationships with Liz? How are Liz and Sarabeth able to restore their friendship? Why is the gift of the bench so important? What is the turning point in Lauren's recovery? What is it that really begins to restore her optimism and interest in life? 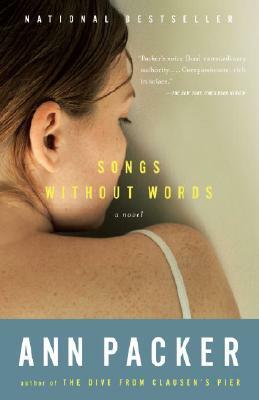 Songs Without Words, though much of it is concerned with suffering, depression and suicide, ends happily, with the restoration of Liz and Sarabeth's friendship and Lauren choosing to embrace rather than hide from life. Why does this ending feel right? How does Packer keep the novel from achieving too easy a closure? What does Songs Without Words reveal about both the strength and fragility of human relationships?